This beautiful old gatehouse from the 1890s is modeled after German and English baronial castles and is a unique feature of North Chagrin that is a popular destination for people of all ages. 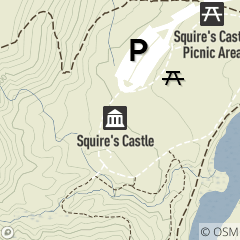 Squire’s Castle should be on your “must see” list for North Chagrin Reservation. The open expanses in front of the castle are great for games and picnics, and the castle itself is a popular spot for weddings or an opportunity to explore the past.